This article is intended as a helpful guide and shows how I solved the code 54 problem. If you are in any doubt, or not qualified, do not undertake this maintenance, consult a qualified mechanic. The author or the GT4 Drivers Club can not be held responsible for any loss or damage resulting from use of this article. 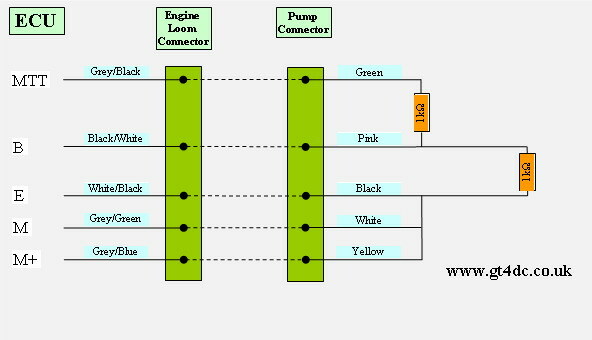 This is a two part problem as the ECU monitors two aspects of the charge cooler setup - charge cooler fluid level and charge cooler pump operation. The first step is to link the charge cooler level sensor pins together in the plug that used to connect to the charge cooler. There are a number of ways of doing this ranging from a simple piece of wire securely inserted into the loom plug to the removal of the plug and direct connection of the loom wires. The problem with overcoming the error is that the voltage supplied to the pump is "monitored" by the ECU. The Pump is not a straight forward fitment to the wiring harness. 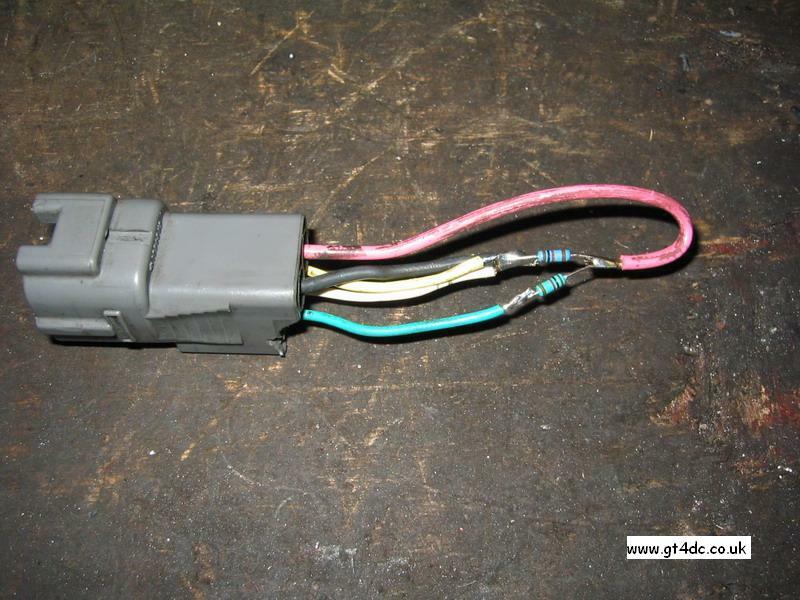 While the motor itself only has two simple "plus and minus" wires, the loom connector has 5 wires, as shown below. Without knowing the exact internal workings of the ECU it is impossible to know what the significance the 4.5 ohm resistor has. Whatever the reason it is clear that the ECU has some feedback connections which allow it to detect that when it activates the charge cooler pump relay, (the ECU does not directly drive the charge cooler pump), a voltage actually arrives at the pump. This allows it to detect if the pump connector has been left unplugged. 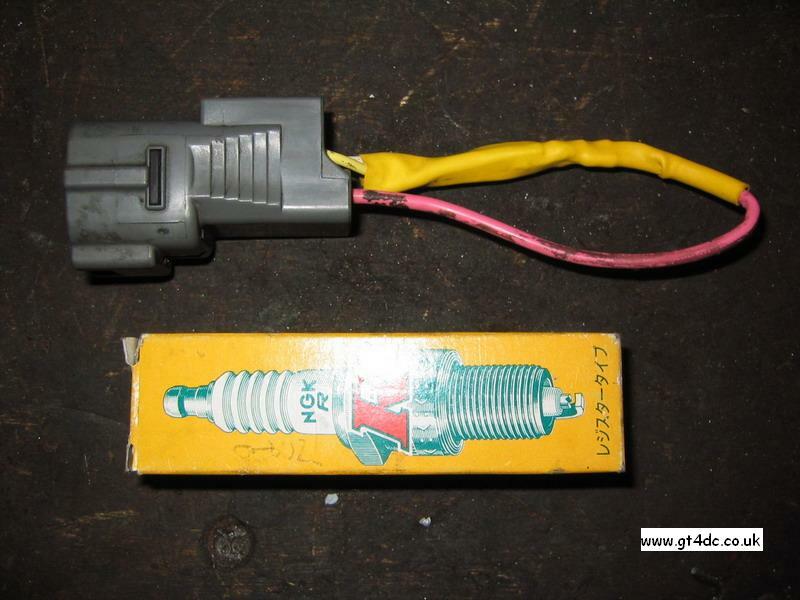 It does not appear that the ECU can detect the pump actually running, just that it is actually connected and a voltage arrives. Others have reported that, for example, if there is an electrical problem within the pump causing an open circuit the ECU will flag code 54. Other users have reported that a slow running pump, (for mechanical reasons), may not cause error codes. 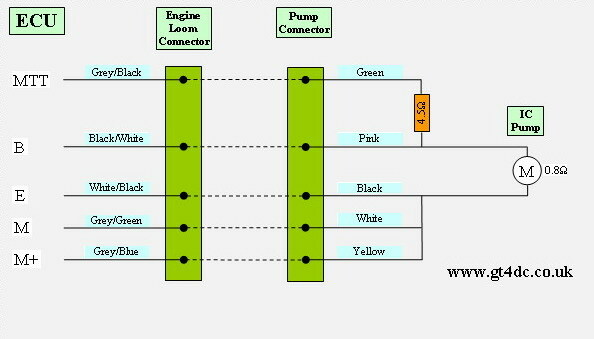 The main thing is to try and fool this system into believing that the pump is connected even when it has been removed in favour of a FMIC. Some experimentation showed that the motor and 4.5 ohm resistor can simply be replaced with 1k ohm resistors, as shown in the circuit diagram below. Although not exhaustively tested these values do turn out the ECU light, unlike other perhaps more intuitive combinations which were also tested. The next step is to implement the wiring. 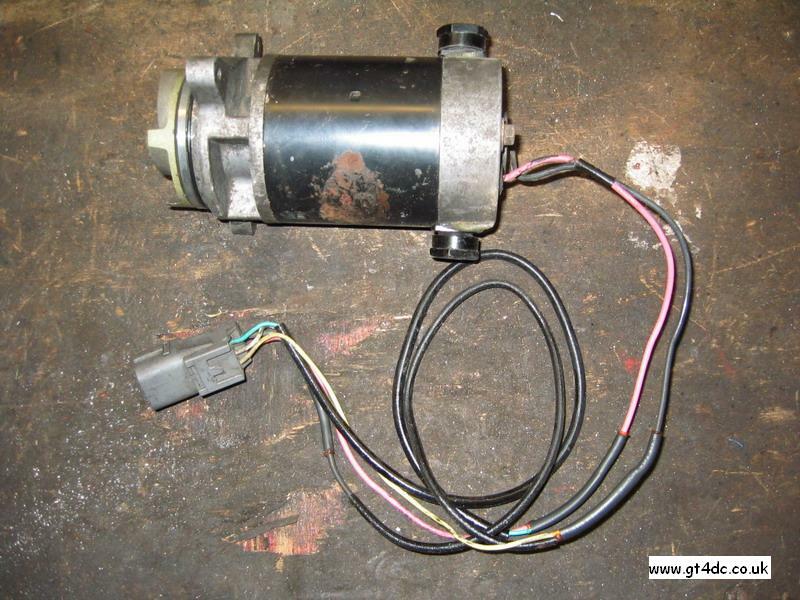 If you happen to have a spare pump handy then it can donate it's connector, or you can remove the connector from the pump on the car or indeed you can even remove the plug from the main wiring loom and make direct connections. On a side note it is quite surprising how large an electrical loading this pump places on the system. The pump draws approx 3.5A when running.